Natalie Portman. Mila Kunis. Vincent Cassel. Barbara Hershey. Winona Ryder. Drama. Horror. Thriller. Dance. Ballet. Recommended. Oscar (Best Female Lead). BAFTA (Best Female Lead). 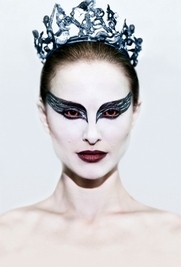 A ballet dancer wins the lead in "Swan Lake" and is perfect for the role of the delicate White Swan, Princess Odette, but slowly loses her mind as she strives to subsume, at the behest of the director, the personality of the Black Swan, Odile. Once again Aronovsky returns to his familiar themes of obsession and addiction (see also 'Requiem For A Dream', 'Pi' and 'The Wrestler') and has created an enigmatic and frustrating film. Audiences have been divided over the degree of success he achieves, but its combination of dreamlike horror and feminist coming-of-age drama is striking to say the least. Overblown, hysterical and uneven it may be, but it's certainly worth a watch.